In the year 1998 a number of land owners met to create a cross-border private nature reserve - on the one and an idealistic undertaking, and on the other hand a hard piece of work, that especially requires perseverance. This idea was initiated and is still supported by hunters, who use their land by sustainably utilising the naturally occurring game. Sustainable hunting is a recognized from of conservation in Namibia and an important economic sector in Namibias tourism sector. Still today hunting, next to photo tourism, is conducted by a number of land owners of the Erongo Mountain Rhino Sanctuary Trust. Some 180 million years ago the splitting of the Gondwana-supercontinent (Africa, South America and Antarctica) - which resulted in the genesis of the South Atlantic - was initiated by extensive basaltic volcanic activity. Due to instability in the Earth’s crust, volcanic activity ensued over the next 60 million years in the area where today the Erongo Mountains are found in north-western Namibia. Continuous outflow of lava resulted in a mass deficit in the centre of the area (todays Erongo Mountains), which was by now surrounded by an enormous lava ‘armour’. This caused the volcanic structure to collapse caldera-like. In this collapsing volcanic structure, magmatic granite appeared along mechanic fissures at the edge of the feature, possibly pressed up by descending blocks of the crater rim. This granite to this day surrounds the former volcano in a relatively well preserved ring. All of this took place underneath the Earth’s surface. In the following 120 million years, the volcanic structure was eroded from its surroundings, at times up to the bottom of the structure. Therefore it is possible today to look ‘into’ the individual stories of the volcanic ruin and study the geologic blueprint in detail - an incredibly exciting endeavour for the geologically interested. 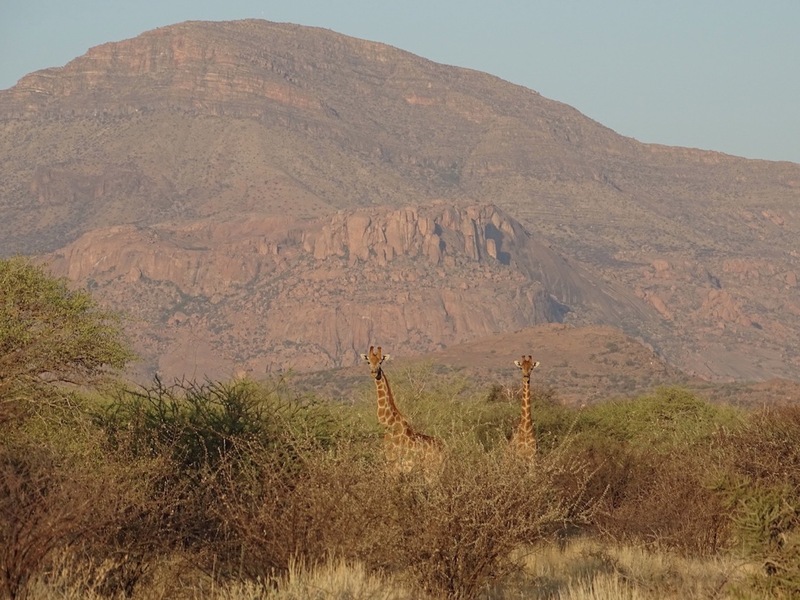 For the geologic layman however, the Erongo Mountains present themselves as an extremely spectacular habitat of rare and endemic species of the arid zone of south-western Africa. Today the former volcano emerges from the surroundings as a rugged mountain range - or rather Inselberg complex - reaching up to 2319 meters. 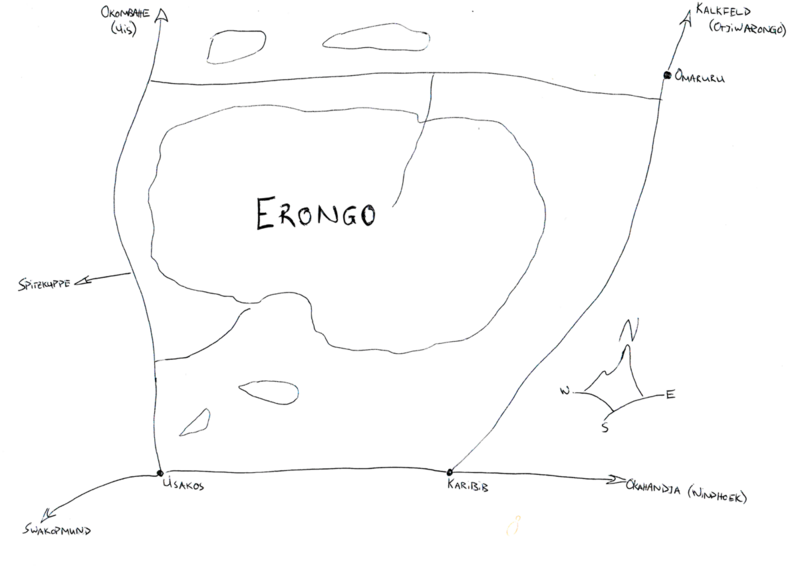 Inside this mountain complex eleven different fossile crater basins and several large valleys can be found. It is an at times ragged landscape that is drained by non-perennial rivers (only flowing after heavy rains in the rainy season). The rivers emerging from the Erongo Mountains flow into the bigger Omaruru River in the North and into the Khan River in the South. This system - the mountains with savannah forelands through which rivers meander, framed with a complex riparian forest - forms a habitat rich in animals. 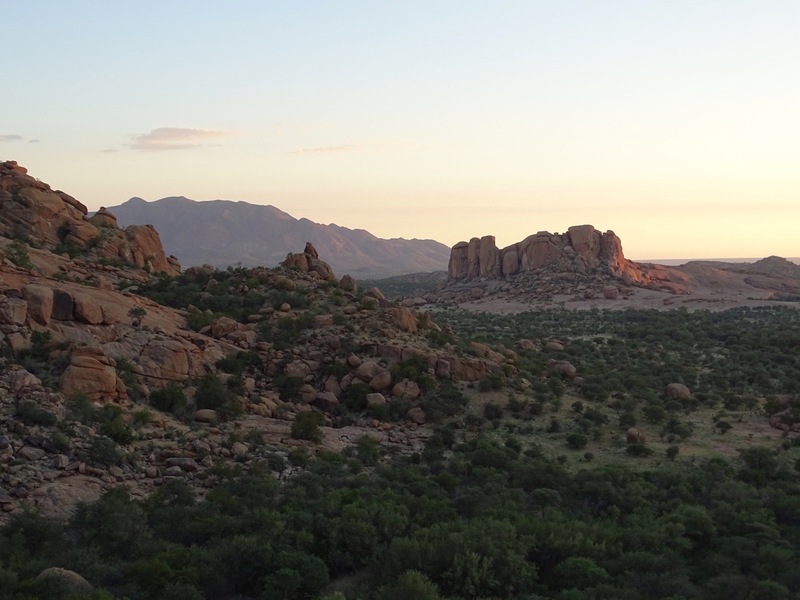 After a first converging of the 30 or so land owners or land units, the Erongo Mountain Nature Conservancy - today Erongo Mountain Nature Sanctuary - was founded in the year 2000. This meant that the framework for the idea of a cross-border nature reserve was set. Already in the first years one of the goals was reached: the endemic Black-faced impala were reintroduced. For another goal, the reintroduction of the Black rhinoceros, the Erongo Mountain Nature Sanctuary had to become a legal entity. This happened in the year 2008 with the founding of the Erongo Mountain Rhino Sanctuary Trust of Namibia. In the same year the first Black rhinos were reintroduced into the Erongo Mountains. Although not all members of the Erongo Mountain Nature Sanctuary (EMNS) are members of the Trust yet, crucial steps have already been taken towards the conservation and protection of the biodiversity of the Erongo Mountains.